On Comex close the GOLD PRICE had gained a measly $2.90 (0.3%) to 1,083.70 while SILVER gobbled up 1.8 cents (0.13) to $14.221. Over the weekend the Paris attacks drove gold out of its flatlining up to $1,098 about 3:00 a.m. Monday Eastern time. Selling began there and gold eroded and dwindled town to $1,093 about 9:30, then fell off and fell off to reach that $1,083.70 close. If there was any safe haven buying present, it was weak and easily overcome by the sellers. Reckon the world trusts dollars, at least until that rattlesnake in the bosom bites ’em on the neck. The SILVER PRICE rose as high at $14.42, made a double top, then began falling sharply at 9:30. Frankly there’s nothing to be made out of today’s trading, except to conclude that interest in silver and GOLD PRICES are so low, and opinion so universally negative, that we must be somewhere close to a bottom. The French CAC fell 1%, the German DAX dropped 0.69%, and the London FTSE rose 0.46%. US dollar index rose 0.37% to 99.46 while the Euro fell 0.78% to $1.0687. US 10 year treasury note yield fell, so the 10 year note rose, which might indicate a flight to safety from Europe to the US, slightly. 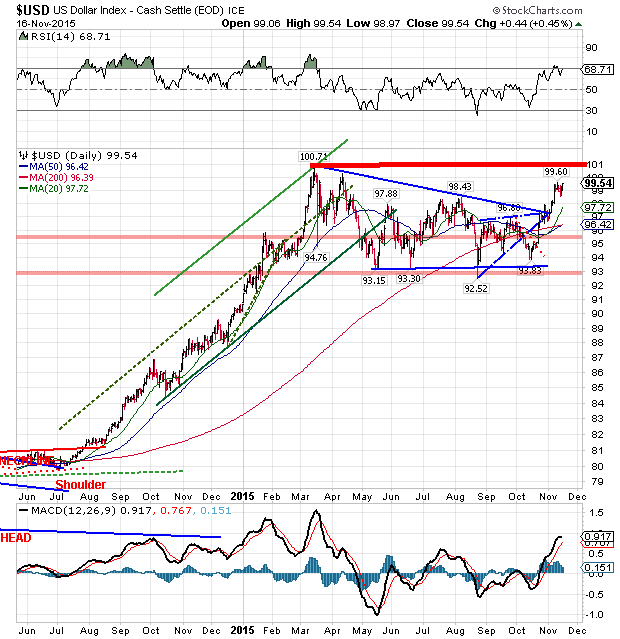 The US dollar index’ correction since the March high traced out a long flat- bottomed triangle or pennant, but now has broken out of that pennant. All that blocks its way to another huge advance is the double top just above 100. On this chart it’s a broad red line. The Dollar Index’ rally began in July 2014, traded up to March, then began correcting. If that pennant marks the half way point of the rally, a possibility, the dollar could rally to 120. Don’t start gasping and grabbing for the defibrillator. It’s only a possibility. One can only picture with sweaty trembling and nausea what sort of world the dollar index at 120 implies. That suggests that even the crippled intellectual Marxists at the Fed would reverse course before that happens. “I hope,” he said in a tiny, squeaky voice. After plunging at first, US stocks reversed and rose bravely. Dow climbed 273.77 (1.38%) to 17,483.01 and the S&P500 bloated 30.15 (1.49%) at 2,053.19. Stock touts and pimps will cheer this as a reversal, but think about it technically. On Thursday stocks crashed through their 200 day moving averages, today in typical fashion they rallied to touch back. No change of direction. In like fashion West Texas Intermediate Crude rallied today back up to the bottom boundary of the range it fell out of on Wednesday. 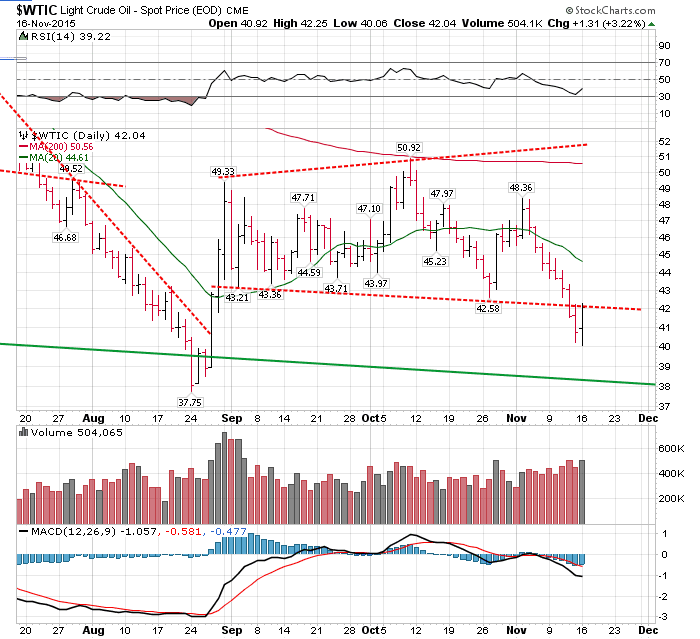 So far, that changes nothing and oil will surely drop further.